Over a breakfast, Darrin Patrick encouraged me to go to seminary. A few years ago, he was my pastor. In some ways, through the occasional conference message, blog post, and published book, like this one, I suppose he still is. 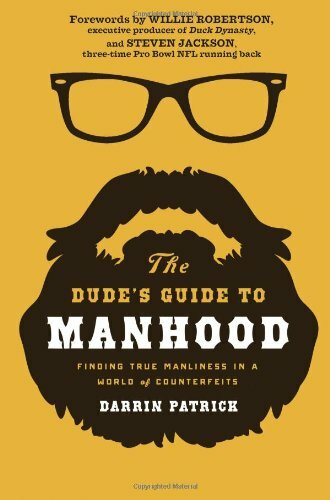 A Dude’s Guide to Manhood outlines 10 authentic pursuits for men, including determination, loving a woman, loving work (excellent material), and contentment. The final 2 chapters show how Jesus is the hero and what it means to have Jesus as your hero (titles: “Get What You Want: The Heroic Man” and “Living as the Forgiven Men”). The book has vulnerability, cultural connections, and direct challenges. It’s a solid road map in a world of forgeries. With respect to the Bible, it’s a zero-depth entry pool, which is a strength not a weakness. A dude that can’t swim isn’t likely to let you throw him off the high dive. Besides, Patrick is building somewhere, wading into deeper waters, namely “Jesus is our hero”—yes, as an example, but more than that, as our savior. In Piper’s blurb, he advises buying a bundle—one to keep, others to give. I only bought one, although I’m doing pre-marriage counseling now with a couple, and guaranteed the dude gets a copy from me.